This is the latest, integral, multi-level conception of hardware cosmetology and luxury care for preserving your youth and beauty. Up-to-the-minute, most effective cosmetic equipment and medications, stimulating active regeneration and improvement of skin, are used in El.Mira Beauty Line treatments. Oxygen treatments are exclusive invention of EL.MIRA Beauty Line Company and based on unique combination of the modest technologies, methods and highly effective cosmetology. 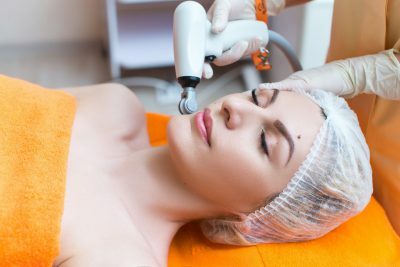 The combination of the methods of Diamond Microdermabrasion, deep oxygen saturation, transdermal delivery of active substances to the deeper layers of the skin with a painless electroporation method, the use of glycolic acid for peeling and highly effective serums, has made it possible to create complexes and treatments for solving a wide range of aesthetic cosmetology: atraumatic facial cleansing, evening out the relief, tone and color of the skin, reducing the depth and eliminating fine wrinkles, “crow’s feet” in the eyes area, removing scars, scarring and post-acne traces, removing edema, intense saturation with oxygen and active nutrients, prevention manifestations of photo-aging. All treatments cover zones of face, neck and decollete, as well as locally over the body. Compatibility of various methods within one treatment facilitates the increase of effectiveness of the treatment and durable long-term result. 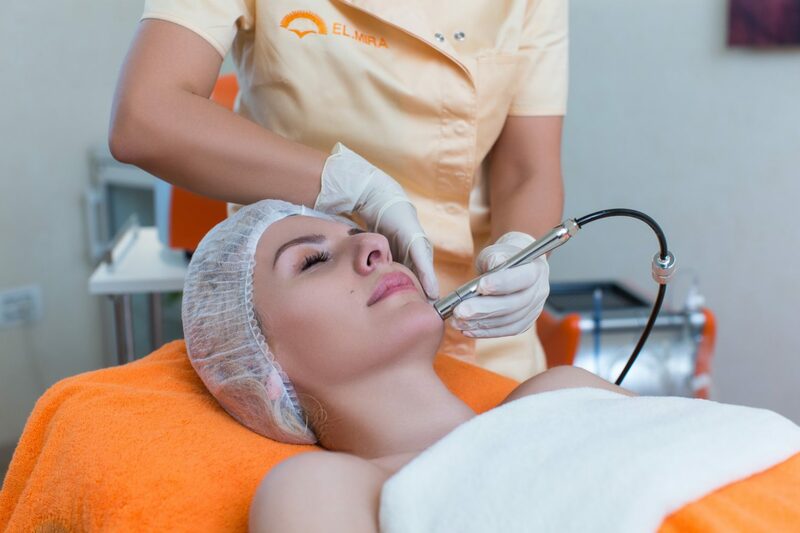 Treatments are carried out on EL.MIRA Beauty Line devices: Turbo Oxy Lift, Beauty Skin Care, Diamond Power. Combination of three different techniques in one procedure increases in the effectiveness of the procedure and controbutes to persistent long-term result. Diamond polishing of the skin aligns its relief and improves the performance of the lymphatic system. Life-giving oxygen enhances metabolic processes. Saturation with active nutrients using electroporation grants radiance and freshness to Your skin! Smooth and perfectly even, well-moisturized skin. Reduction of the depth of wrinkles and prevention of the appearance of any signs of aging or pigmentation. The area of usage:Face, neck and chest. Body - locally. The interaction of three different techniques in one procedure contributes to an increase in the effectiveness of the procedure and a sustainable long-term result. Polishing the skin with diamonds aligns the relief and improves the performance of the lymphatic system. The oxygen jet saturates with moisture and strengthens metabolic processes. Saturation of active nutrients by electroporation method gives radiance and freshness. Removal of small wrinkles and reduction of depth of mimic wrinkles. Prevention of initial signs of skin againg in shortest time. Improvement of face oval, skin tonus. The procedure rejuvenates the skin, contributing to collagen output. The most recent method of delivery of active components into the deepest skin layers with electroporation nourishes the face with natural extracts: intensive moisturizing, stimulation of collagen output, lifting and reduction of wrinkles. Impact of the mask depending on the skin type intensifies with massage using special technique for the best lifting effect. Alginate mask from seaweed or collagen leave will fixate the outcome for a long time. Oxygen veil is a specific accord in the beautiful ensemble of methods, techniques; cosmetology and mastery of professionals provide extraordinarily pleasant feelings of freshness. Deep intensive moisturizing of skin, reduction of wrinkles’ depth, face oval lifting. Multi-stage layered system of deep skin cleansing is based on combination of face polishing with diamonds with glycolic peeling with subsequent oxygen saturation. The most recent method of delivery of active components into the deepest skin layers with electroporation nourishes the face with natural extracts. Nourishing with vitamins A, B, C and E contribute to vitaminization and regeneration. Intensive lifting of the whole face, removal of small wrinkles, profilactic of signs of photoaging, even and smooth shining skin. Shining, deeply cleansed face, intensively filled with refreshing oxygen and irreplaceble hyaluronic acid. It smoothens and refreshes Your skin. Light massage with special cream absorbs to skin and calms it. Alginate mask and cryotherapy with concluding cream fixates the end result. Well cleansed and deeply moisturized face, even face tone and skin relief. This is a perfect procedure for a grand outgoing and a significant event in Your life. Exclusive antiaging treatments with immediate effect significantly reduce visible wrinkles from the outside, slow the aging process of the skin from the inside. 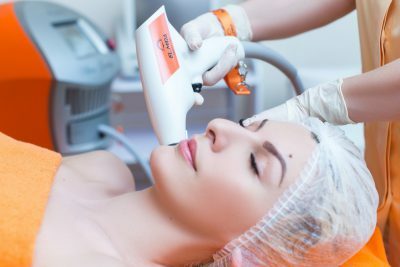 Combination of the up-to-date technologies: radio frequency, laser and IPL, as well as the unique combination of EL.MIRA Beauty Line devices intensifies the effectiveness of each other. Oxygen enrichment and saturation multiply the effect of treatments and provide additional effect. Antiaging treatments of EL.MIRA Beauty Line stimulate elastin and collagen synthesis; include the processes of physical regeneration, restore natural level of moisture and oxygen in the skin; lift the skin, give it firmness, softness and elasticity, remove fine wrinkles, even out and freshen face color, strengthen and model face oval. Individual approach, when a beauty expert takes into account your skin type, its sensitivity and condition as it is, helps you to prolong your youth, give back freshness, brightness and beauty! This luxurious anti-aging procedure is unique with the interaction of three different techniques in one, which increases its effectiveness and sustained long-term result. Diamond polishing of the face and deep saturation with oxygen prepare the skin for the enhanced effect of radiofrequency exposure. Radiofrequency exposure (RF) on Face and Body Contouring EL.MIRA Beauty Line device, with control of the depth and intensity of warming, contribute to the intensive rejuvenation by stimulating the synthesis of collagen and elastin. Improved skin turgor and improvement of facial oval. Elimination of signs of aging. Reduction in the volume of the face and skin flabbiness. Unprecedented machine photorejuvenation technologies on Infinity EL.MIRA Beauty Line device and non-ablative laser ND-YAG Q-Switch 1064 are combined in an exclusive Anti-age procedure called “Golden standard of rejuvenation”. Controlled warming of tissues and fractional impact of the laser on the lower layers of epidermis stimulates the growth of new collagen, as well as contracture and tightening of the skin. The procedure is painless and does not require recovery period, there is no need for preliminary preparation by anesthetics, the procedure is safe for all skin types. Decreased emergence of age-related skin defects, such as; wrinkles, crow’s feet, photoaging, uneven tone, texture and flabbiness of the skin. Photorejuvenation on the devices of the newest generation Lazer Beauty System and Infinity EL.MIRA Beauty Line use the principle of photothermolysis, in which the intensively-pulsating IPL light changes into heat and penetrates into the basalt layer of the skin, stimulating the synthesis of collagen. The safety of the procedure is ensured by monitoring the depth of warming up and the strength of the pulses. After the procedure, the tone of the skin improves, it becomes more elastic and healthy, beautiful, even color emerges. Oxygen saturation and a special mask enrich the procedure and increase its effectiveness. The procedure is painless and does not require a recovery period, there is no need for preliminary preparation by anesthetics and it’s is safe for all skin types. Elastic, beautiful, healthy and tight skin, pronounced rejuvenating effect. Unique combination of two technologies in Ultra Gravity EL.MIRA Beauty Line device allows to achieve fast and consistent results of rejuvenation and lifting. 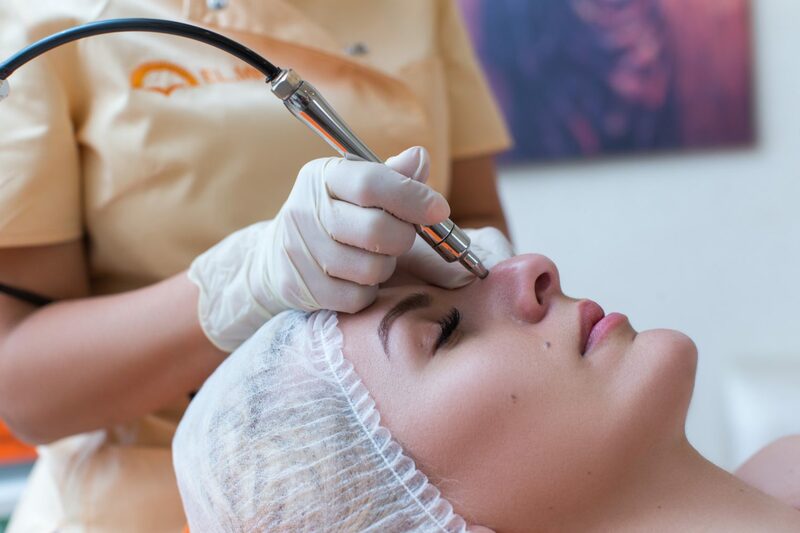 Due to the special configuration of the electrodes, bipolar and unipolar radiofrequency impact is combined, which guarantees an accurate adjustment of the warming of the tissues and improves the elasticity of the skin. Radio waves of high frequency (40.68 MHz) cause the rotation of dipole water molecules, which in the bound state is contained in all cells of the body. Blood microcirculation and fluid outflow from the subcutaneous fat is improved, thereby reducing the total volume of tissues. Rejuvenation, removal of deep and fine wrinkles, circular face lifting. The state-of-the-art technology of infrared rejuvenation, non-surgical lifting has firmly taken its position in machine cosmetology. The procedure on the Infinity EL.MIRA Beauty Line device provides a long-term rejuvenation effect with an immediate visible result of tightening and lumination of the skin. Clear facial oval, improvement in the elasticity and tone of the skin, decrease in the depth of wrinkles, reduction in the number of “vascular asterisks,” getting rid of excess pigmentation and eliminating facial swellings. The beautiful gem of the EL.MIRA Beauty Line collection of procedures “Triple oxygen anti-aging lifting” on the “Infinity” device is based on a combination of ultra-modern infrared rejuvenation IPL-system technologies and ND-YAG Q-Switch1064 laser. There are no analogues to this procedure. Thanks to infrared lifting, the organism can stimulate the formation of new collagen and elastin fibers and restore the elasticity of the old ones during 1 session, because only infrared light can impact the collagen fibers in the deepest layers of the skin, without affecting other tissues. Due to the fact that infrared heat gives a powerful impetus to the fibroblast cells producing new collagen fibers, the effect obtained will be further intensified within six months. 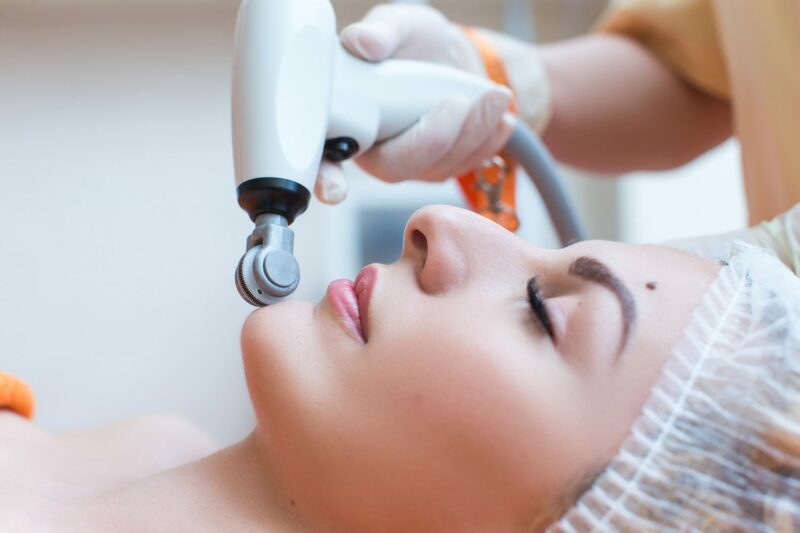 The procedure provides both short-term and long-term benefits with an immediate visible result of skin tightening and lumination, as well as restructuring the skin architecture helping to strengthen it from the further aging. Instant skin tightening and a healthy skin color. The need for plastic surgery is postponed for several years. 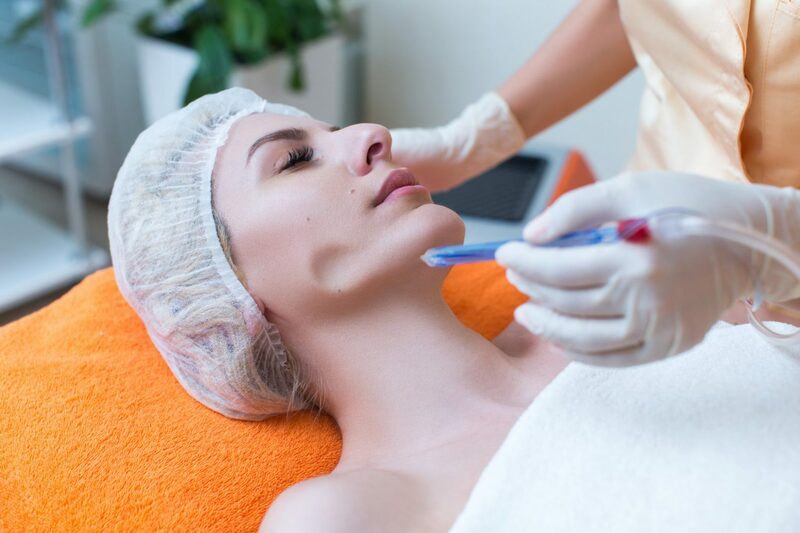 A powerful procedure for skin renewal and rejuvenation is aimed at removing the surface layer with a minimal risk of side effects. 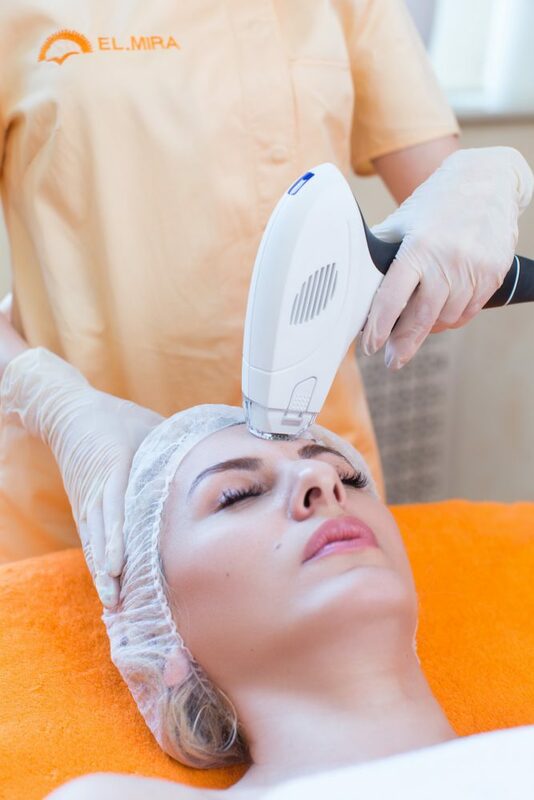 The technology of fractional RF-thermolysis allows to influence only certain areas of the skin while maintaining a significant part of the skin intact, due to which there is a rapid recovery of the epidermis. The procedure of “Intensive Skin Renewal” on the Lazer Beauty System from El.MIRA Beauty Line is intended for the solution of a wide range of aesthetic cosmetic problems: post acne, narrowing of pores, diminishing face volumes, eliminating skin slides, rejuvenating and renewing aged skin. The procedure is performed with anesthesia in 1-1.5 hours. Smooth, even, renewed skin, clear oval, healthy, beautiful smooth face tone. Solution of such complex problems as removal, treatment, reduction of striae, scars, swordcuts, stretch marks, veins and vessels, tattoos, pigment stains, anti-acne and couperosis removal, reduction of face and body volume, intensive lifting became possible due to EL.MIRA Beauty Line aesthetic treatments. 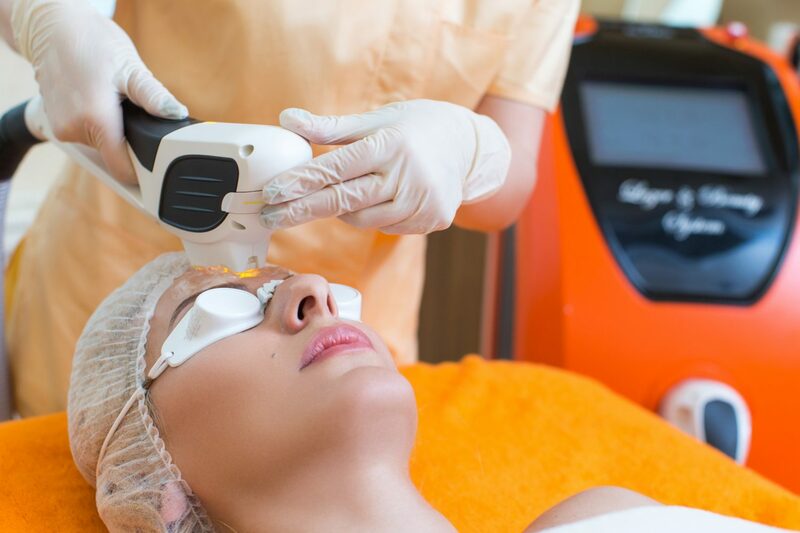 These contemporary multi-level treatments, intended for the elimination of various problems either on the face and on the body, use the most up-to-date technologies: RF System, neodymium laser Q-Switch ND YAG 1064, LP Nd:YAG 1064, iPixel Er:YAG 2940TM, INFRARED, IPL, oxygen saturation. EL.MIRA Beauty Line aesthetic treatments do something that seemed impossible a while back. Highly effective procedure is carried out on Infinity EL.MIRA Beauty Line combining state-of-the-art technologies of infrared thermolifting and laser ND-YAG Q-Switch1064. Thanks to infrared lifting, the skin can be stimulated to create new collagen and elastin fibres and constrict existing ones after just one procedure, because only infrared light can precisely affect collagen fibres in the deepest layers of the skin, bypassing other tissue. 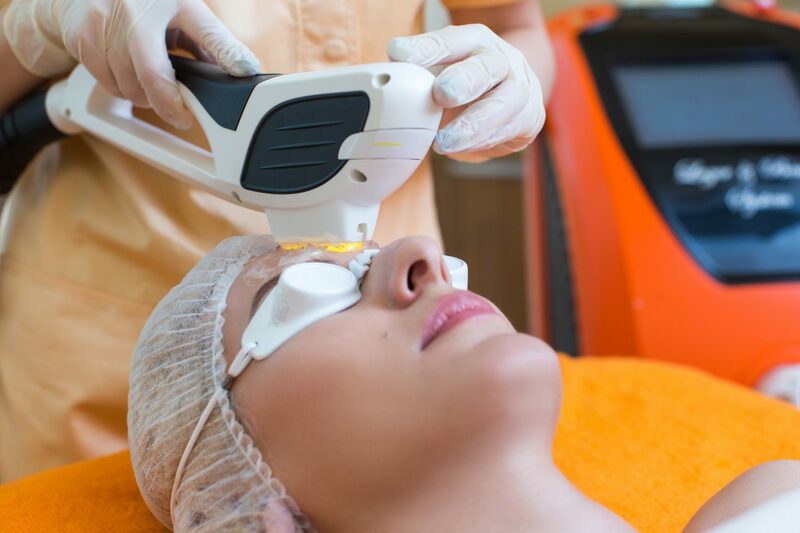 Due to the fact that infrared heating provides strong impulse for fibroblast cells producing new collagen fibres, the outcome will progress during 6 months. Fractional non-ablasive high-density laser ND-YAG Q-Switch106 4 strengthens the effect of infrared lifting, helps to manage different age-related skin defects, impacts delicate neck, chest area, as well as thin areas of skin. The procedure guarantees both short-term and long-term advantages with immediate visible results of lifting and lumination of skin, including restructurisation of skin architecture, tightening it from future aging. Immediate skin lifting and healthy skin color. Smooth skin without scars and marks is what every woman dreams about. Innovative «double system» of modern machine cosmetology represents the combination of two procedures effectively complementing each other – radiofrequency injection therapy mixed with ultrasound therapy. RF – radiofrequency fractional impact creates controlled contactless skin perforations. Special technology of ultrasound transepidermal delivery of drugs creates high acoustic and vortex pressure and carries out high-speed delivery of active medicals to deep layers of skin. Even and smooth skin. Removal of scars, marks, stretchings. The result of treatment with Face and Body Contouring EL.MIRA Beauty Line – facial skin becomes more smoooth and lifted, like after polishing, however the surface of the skin remains safe and sound. Procedures carries out soft bipolar radiofrequency impact. Few grades of power, and control of heating depth allow to select the most suitable mode fitting your indivual case. Impact of radiofrequencies stimulates the activty of fibroplasts, which leads to thickening of collagen-elastin carcass, reduces the depth of wrinkles and significantly reinforces skin tonus. You will feel a pleassant soft heat uring the procedure. It is absolutely painless and does not carry any infection risk. Oxygen saturation strenthens the effect of the procedure and has a salutary moisturizing impact on the skin. The skin becomes more elastic and lifted, the face volume decreases and oval becomes very clear. Adolescence is often associated with oily problem skin, acne and inflammatory formations. Purulent inflammatory processes, acne, dilated pores and comedos transform into scarring, infiltrate and post-acne marks. The disease normally disappears in the process of growing up and with normalization of hormonal background, however, there are cases when the acne problem can persist through lifespan and results in complexes, depression and low self-esteem. That’s why, treatment of acne must be timely and complex, with due attention. 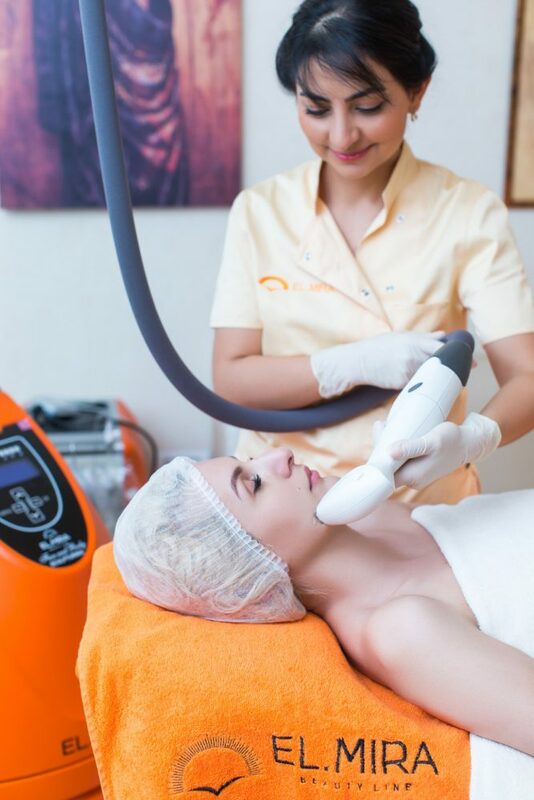 Multifunctional system of photothermolysis IPL therapy with «Laser Beauty System» device from EL.MIRA Beauty Line is one of the fastest and most effective methods of acne and post-acne treatment. The basis of photothermolysis treatment lies in the impact on sebaceous glands. It decreases the volume of sebaceous glands and fat secretion, resulting in improvements in cases of acne. Even, smooth, clean, healthy skin. Emergence of vascular web on the face is called rosacea among professional cosmetologists. This is a vascular skin disease. Reasons of its emergence are not determined. It can be due to hormonal dysfunction, inflammation of oral cavity, caries and vegetative neurosis. Rosacea is more frequently observed in women and men above 40. Multifunctional system of photothermolysis IPL therapy with Laser Beauty System device from EL.MIRA Beauty Line is one the fastest and most effective methods of removal of vascular formations (couperose, rosacea, vascular asterisks, port-wine stains, dilated capillaries) without any damage of skin surface, i.e. without rehabilitation period after the procedure. Reduction and removal of vascular asterisks, even and beautiful skin color. Highly effective procedure of removal of damaged skin is guaranteed by high technologies of innovative machine cosmetology. Cooled neodymium laser ND-YAG guarantees the depth of penetration and stronger heating, thus easing the treatment of deep damages, which cannot be removed using shorter frequency waves. Simultaneously contact cooling, inserted on the header tip cools the skin during the procedure for a long period of time, which minimizes the risks of side effects and leads to more comforting feelings during the procedure. Removal of “vascular asterisks” and reduction of their number. A number of problems, requiring timely, qualified and effective solution, may appear in the process of weight reduction and body contours forming. First of all, it is associated with the appearance of skin sagging and stretch marks, formed either because of a too sharp decrease in excess body weight, or as a consequence of age-related changes, collagen-elastin balance responsible for normal skin tone. Принцип работы аппарата основан на, мягком биполярном, радиочастотном нагреве подкожной коллагеновой прослойки и эластиновых волокон приводящем к сжатию и утолщению коллагено-эластинового каркаса, вследствие чего происходит восстановление упругости и эластичность кожи, уменьшается проявлений целлюлита, устранение провислостей кожи. Инновационное объединение радиочастотной технологии и кислородного насыщения позволяет добиться быстрых, видимых и стойких результатов. Сочетается биполярное и униполярное радиочастотного воздействия в аппарате Ultra Gravity EL.MIRA Beauty Line с технологией VE SHAPE идеально подходит для локальной работы с различными частями тела для уменьшения объемов и подтяжки кожи. Значительное уменьшение объемов проблемных зон, увеличение упругости кожи и разглаживание ее рельефа, улучшение микроциркуляции и обмена веществ, уменьшение объемов жировых клеток, улучшение метаболизма. The area of usage:Тело полностью, локально: ноги, живот, верхняя часть рук. Живот, внутренняя часть ног, наружные части ног ("ушки" "галифе"), галифе, колени, руки полностью, обе ноги полностью. процедуры на аппарате Ultra Gravity VE SHAPE - Живот - 200$, внутренняя часть ног - 350$, наружные части ног ("ушки" "галифе") - $300-400; галифе - $250-300; колени - $150-200, руки - $200-300, руки полностью - $150-200, обе ноги полностью - $550-700. The procedure combines radiofrequency treatment on the most recent generation of radiofrequency device Face and Body Contouring with the deep oxygen saturation. Bipolar, radiofrequency heating of subcutaneous collagen layer and elastin fibers resulting in constriction and thickening of collagen-elastin carcass, which leads to recovery of tightness and elasticity of the skin. Innovative technology based on which this device was developed, combines radiofrequency and vacuum effect. 4 vacuum and 4 radiofrequency outputs allow controlling the depth of heating of various skin layers and building up the program depending on Your individual characteristics and needs. Intensive oxygen saturation and manual massage amplify the effect of radiofrequency impact and lead to prolonged results. Procedure is absolutely painless, does not require anesthesia and is not followed by rehabilitation period; you can return to your daily routine immediately after the procedure. Oxy Body Sculpturing procedure is aimed at tightening of skin and body modeling. 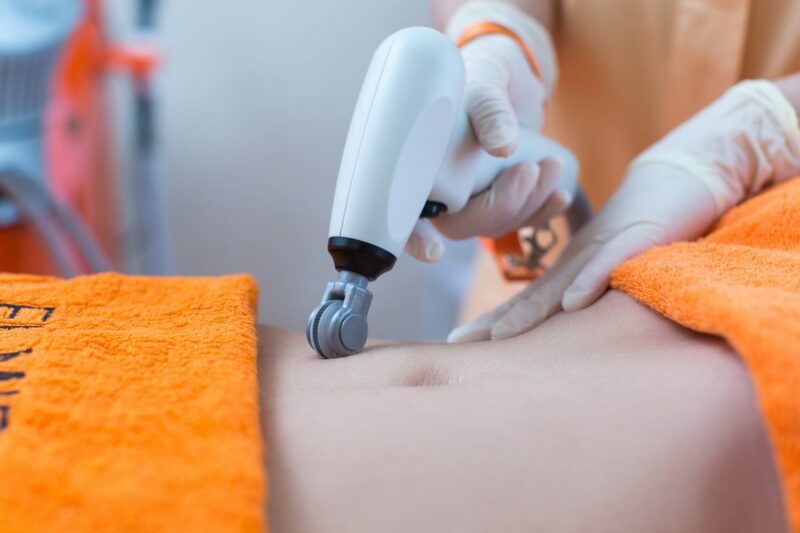 Oxy Lifting Body procedure is aimed at removal of loose skin and stretch marks, which occur during weight loss, or age-related changes of collagen-elastin balance responsible for skin tonus. 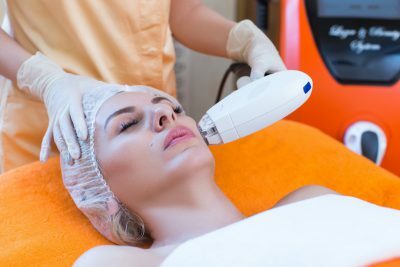 Procedure combines radiofrequency therapy on a new generation Face and Body Contouring device with deep oxygen saturation. 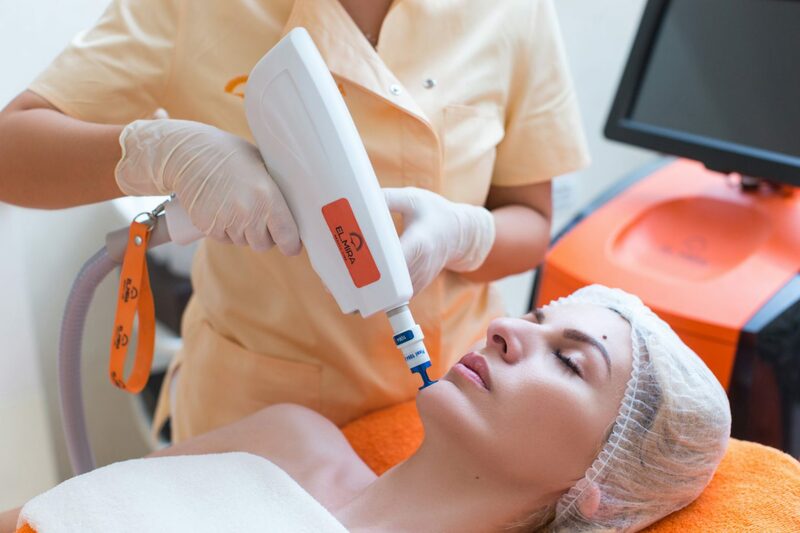 Innovative technology used in creation of this device combines radiofrequency and vacuum impact. 4 vacuum and 4 radiofrequency outputs allow controlling the depth of heating of various skin layers and building up the program depending on Your individual characteristics and needs. Recovery of collagen-elastin balance, skin tonus, removal of skin flabbiness and stretchings. Oxy Body Contouring procedure is perfect for those who want to make local body contour corrections, as well as lift and tighten the loose skin in any given facial and body area. Local correction of body contour, including lifting and tightening of flabby skin on any part of the body. Bipolar, radiofrequency heating of subcutaneous collagen layer and elastin fibres results in constricting and thickening of collagen-elastin carcass, which leads to decrease of volume of subcutaneous layers, recovery of tightness and elasticity of the skin. 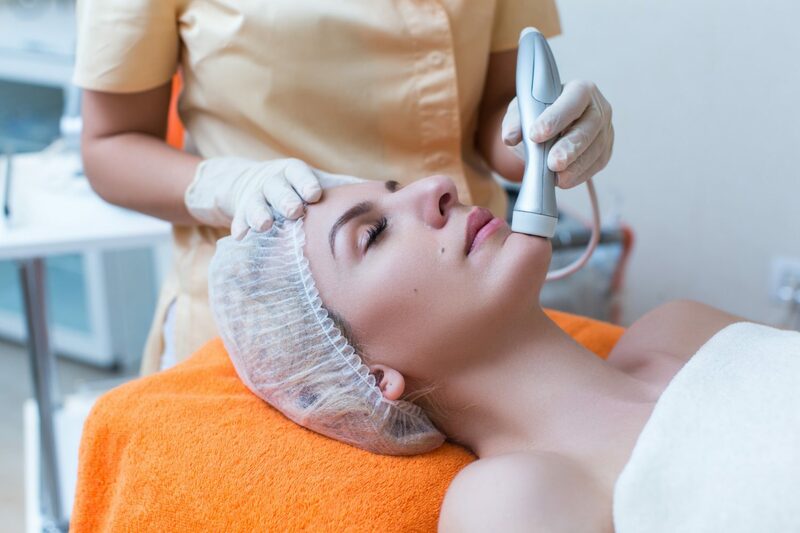 The procedure combines bipolar and unipolar radiofrequency impact of Ultra Gravity EL.MIRA Beauty Line device with the VE SHAPE technology, which is perfect for local treatment of various parts of the body in order to reduce volumes and lift the skin.